I have drawn and painted quite a few “faces” in recent weeks. I used a range of media provided, in these amazing art apps. They look much like works I do on paper and canvas. It’s so handy drawing and and painting this way. No set up of materials; I just flip open the iPad lid, and off I go. 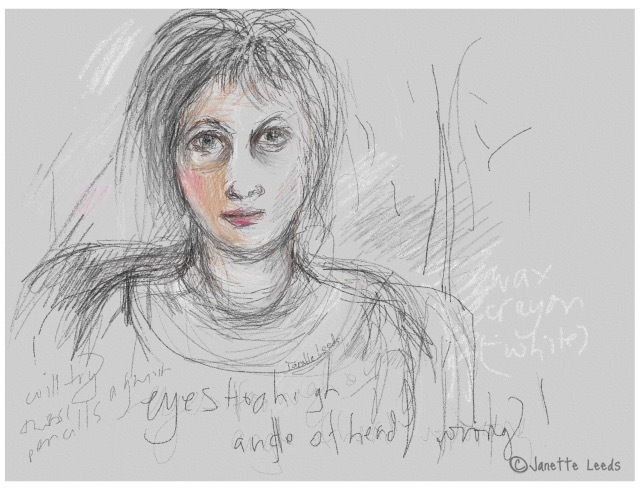 I get a lot more; sketching, experimenting and artworks completed, in a shorter space of time. Helpful, when time is sometimes difficult to find for my art and writing. And the more you do, the better, to see where you are going! 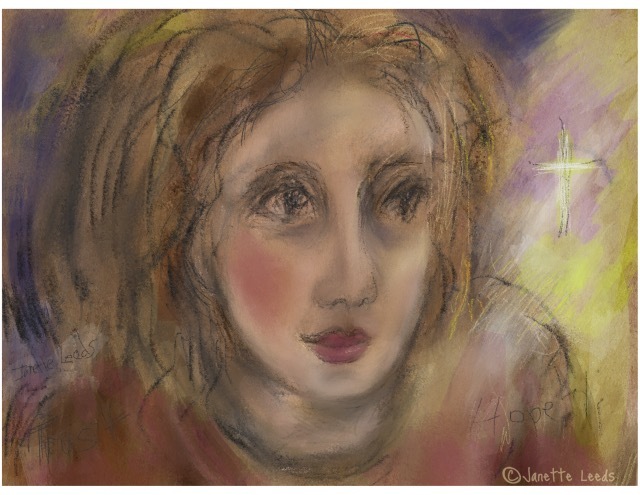 I drew this with oil pastel and a bit of coloured pencil and smudge tools, in the “Art Set Pro” app. Much of the fun, when writing and drawing, is in the process, even when the end result is not always successful..
I’ve exhibited my artwork (on paper and canvas) only a handful of times over the years. As well, as sharing some of it in the form of handmade books of illustrated poems. I plan to exhibit my art again, at some stage. I also hope to print more of my illustrated poems, and turn a collection of them into and ebook, using a wonderful app called “Book Creator”. Late last year I had an exhibition of my iPad art prints in our local cafe. It went well. There’s more information about it on my page, “Some App Information”. I’ve experimented quite a bit with printing up my iPad art: as laser prints; on my home printer, and more recently as giclee prints, via uploading them from my iPad, to a printer: www.codeice.com.au. Paint, conte pastel and smudge tools in “Art Set Pro”. The prints are excellent and reasonably priced. *Update: now I’m able to print great quality prints at home; and these (along with work in traditional media) will serve well for any future exhibitions. Before printing my art I place a white border around them. I often use a page in the Book Creator app, to do this. Paint, graphite pencil, texta, smudge tools in “Art Set Pro”. To enlarge all, please touch on one of the pics below. I scanned this in with my iPad using the “Scanner Pro” app. Took the scan into “Bamboo Paper” and added some colour washes. I soften lines around the mouth in “Art Set Pro”. 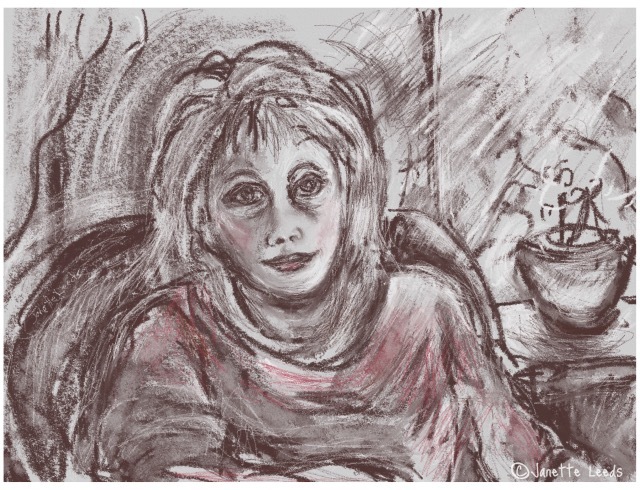 Quick sketch – pencil, paint in “Bamboo Paper”. Another sketch in “Bamboo Paper”. 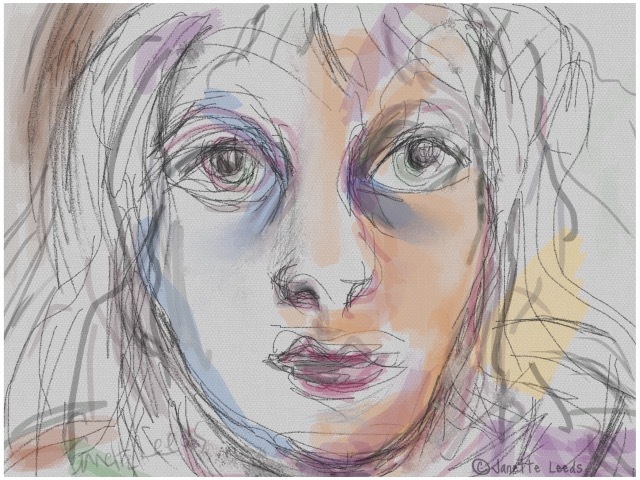 A quick sketch in an app called “Paint It”. I did most of this in “Bamboo Paper” then, in “ArtSet Pro” added tiny bit more wash to the left, and some more lines. 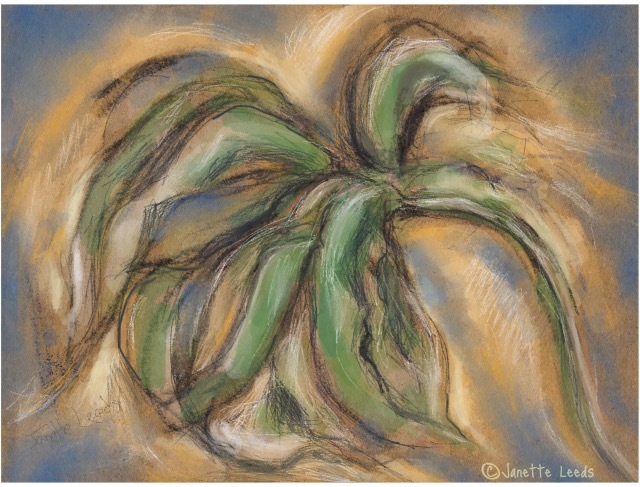 Used pencil and wax crayon in”Art Set Pro” app. 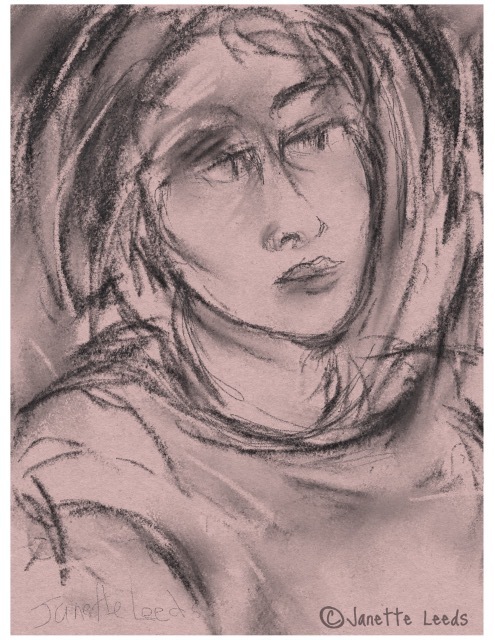 The lovely charcoal in “Art Set Pro”. I used paint, pencil, wax crayon in “Art Set Pro”, on a brown paper surface. 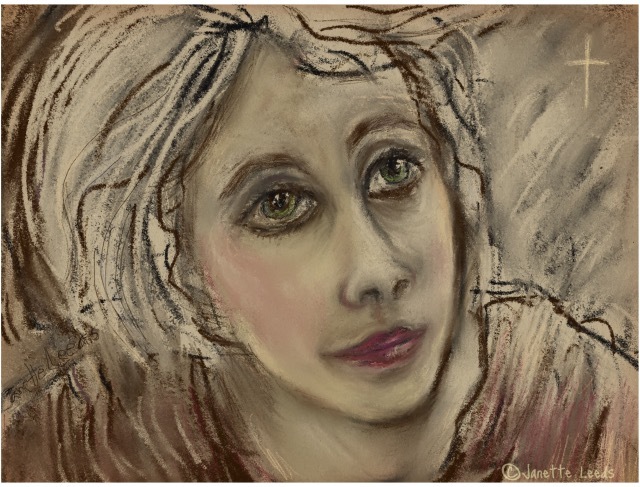 Painted this on a brown paper surface and used smudge tools, in “Art Set Pro”. I’ve discovered blogging is like having a journal online, and helps me: sort out my art, try out ideas, and organise, develop and plan some of my art adventures. I also pray and try to follow God’s lead in all I do – a comfort and a blessing. So God willing, I’ll get time to do all that I want to do…whatever happens, I’m thankful. Hope you have a happy, creative and blessed weekend. Thank you for your encouraging comment. Eventually – hope to get some ebooks completed…have made a start on a few! Sounds lovely to be enjoying time with your grandson…time with family is the most precious thing. 🙂 Have a great weekend. ~ Janette. Those are tremendous sketches. They seem to capture lots of emotion. Glad to hear that. Thank you so much! Beautiful, tender, vibrant, and inspiring! Such a lovely collection of words, and all for me! I’m flattered; thank you Paul! Code Ice ‘tho sounds like an undercover police operation to find drug makers and drug dealers!!! Me, not into drugs, unless you call photography and computing drugs. Funny 🙂 Though does sound a little shady! But is quite safe.. Enjoy your weekend. Yay! Daylight saving begins tonight, or rather after midnight….Enjoy the rest of your weekend! Goodnight. ~ Janette. Interesting and varied work with lots of texture, Janette! And thanks for all the info too. Thanks Laura! It’s great to be able to get similar textures to those I do on paper and canvas. Enjoy sharing the info. Hope you have a lovely weekend. ~ Janette. Such a wonderful variety of mark making and textures in your drawings. Thank you for all the information. I wonder what kind of apps David Hockney uses? Thank you. David Hockney used the “Brushes” app. I haven’t used it much; wasn’t that keen on it. that keen on it. Probably try it again sometime and see how I go. 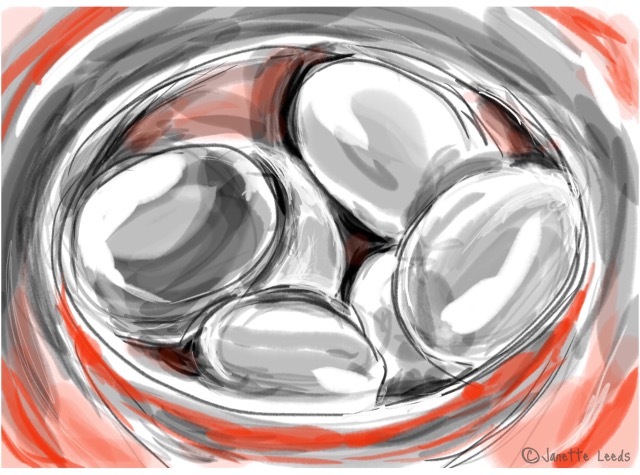 Here’s a link from the sidebar of my blog, about some of David Hockney’s iPad art. You are blessed with lots of talent. I admire your artwork. Oh, no – I did not see that yet. I have to go back and see more of your blog posts. So glad we have a lovely friendship blossoming here. Thanks so much! Beautiful work, Janette. I like your choice of colors and the freedom of your line. I know what you mean about the joys of tablet work! No art supplies, no mess, no setup – I just open up my tablet and draw! It’s what got me started again after years and years of not drawing.